There are times when apologies are not enough. In the Japanese manga and film Ichi the Killer, the yakuza Kakihara slices his tongue in half and offers it to his fellow gang-leaders in their syndicate to make restitution for torturing another yakuza, under the mistaken belief that he was responsible for the disappearance of his own boss. While I can't quite advocate those responsible for the Iraq war carrying out a similar act of contrition and penance, it'd be nice to think that if they're not going to properly apologise and instead continue to only make more than clear why they fell into such a hideous mistake in the first place that they'd just shut up. Well, at least we know that he and Rumsfeld were on first name terms, although why you'd want to be is a mystery in itself. After 4 years then, Hoon's conclusion is that they missed the vice-president, long regarded as being the real power behind the commander in chief. To give him a slight amount of credit, this may be more out of defending the special relationship than anything else, as the whole Iraq debacle and almost everything since then has only made one thing clear: we have absolutely no influence in Washington whatsoever. Blair was taken for a ride because he either couldn't see the real reasons behind the inexorable march to war, or he indeed did and was fully behind them, only for his "liberal intervention" to go horribly wrong. Or rather, as we know, they didn't do any planning for any sort of aftermath. The State Department drew up a full plan for post-Saddam Iraq only for Rumsfeld to throw it out the window and leave Paul Bremer to install his shock therapy, both economically and socially. Oh, that's all right then. Geoff's came to terms with himself everyone! This is the type of vapid navel-gazing after the fact that you expect from a teenager, not a politician. Perhaps, maybe, should, it's all a little bit late. Of the summary dismissal of Iraq's 350,000-strong army and police forces, Mr Hoon said the Americans were uncompromising: "We certainly argued against [the US]. I recall having discussions with Donald Rumsfeld, but I recognised that it was one of those judgment calls. I would have called it the other way. His argument was that the Iraqi army was so heavily politicised that we couldn't be sure that we would not retain within it large elements of Saddam's people." The other huge error which isn't mentioned here is the reliance of the US on the Iraqi exiles who had both their own agendas, as well as some of them not having been in Iraq for decades. Their faulty information was at the forefront both of the intelligence which was dead wrong, and at the decisions which were then subsequently made. 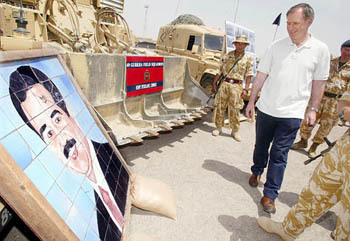 The imposition of the puppet Coalition Provisional Authority, over the head of any interim Iraqi authority which could have advised and helped avoid these monumental errors was of much the same problem: the complete failure of the British government to have almost any influence whatsoever. We know through various memos that Sir Richard Dearlove had indicated that "the intelligence and facts were being fixed around the policy" and that Blair would not budge "from his support for regime change". We know that the dossiers were sexed-up. As for Hoon's memories of the intelligence he say week in, week out, Robin Cook, who doubtless saw the exact same intelligence, made clear in his resignation speech that "Iraq probably has no weapons of mass destruction in the commonly understood sense of the term - namely a credible device capable of being delivered against a strategic city target." As it turned out, even Cook's mentioning that Iraq probably had biological toxins and battlefield chemical munitions was wrong. 2 million on the streets of London came to a different conclusion, a majority on the UN security council came to a different conclusion, even the Liberal Democrats came to a different conclusion, and that was without 4 years of hindsight. If even now the ministers responsible for this catastrophe cannot think of any different outcome, then maybe they really do deserve having their tongues ripped out. Two cheeks of the same arse. The Daily Express: dead horses beaten daily. All our heroes are dead or corrupt.